How do I know? Well, technically, I don't. 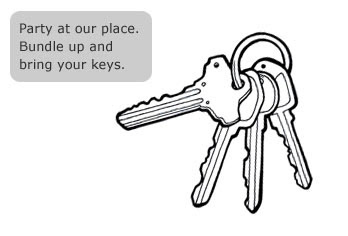 Technically I'm just guessing - but the latest Criterion newsletter included the above image of keys and slogan and, frankly, I don't think they could possibly be referring to anything else. Zombie Drew may have other ideas. He correctly identified the last Criterion clue as indicating Cornel Wilde's The Naked Prey for which I am now awarding him an imaginary gold star (which may, or may not, look just like Claire Danes, the star of David or the bath mat in Ozzy Osbourne's en suite depending on which Zombie Drew would prefer).